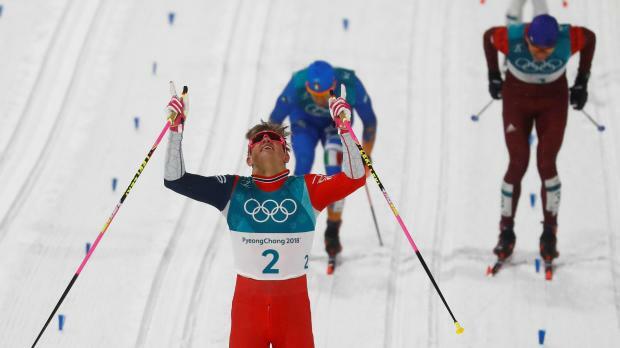 Johannes Hoesflot Klaebo of Norway celebrates after crossing the finish line. Johannes Hoesfolt Klaebo powered to a stunning victory in the men's Olympic sprint classic on Tuesday to claim another cross-country gold medal for Norway with a dominant performance in the final. After a disappointing 10th place in the skiathlon, 21-year-old Klaebo was in the mood for revenge as he lined up for the qualifiers. Bolshunov fought to hold his position but Pellegrino dug deep to mount a challenge, edging in front on the final straight. The two men thundered towards the finish line, both lunging to cross first, and after a photo finish the Italian was declared the silver medallist. Klaebo was delighted with his first Olympic win and said he had put the skiathlon behind him. "I don't feel like it's revenge, for me this has been goal form the Mohole season. To be able to deal with the pressure from the last couple of weeks, it's a great victory and it feels quite good," he told reporters. Klaebo revealed that his decision about when and where to make a break for victory was not a spontaneous one. "I'm thinking about the last uphill for a long time. I was quite strong in the start of the final, my plan was always to be able to run fast in the last uphill. To be able to get the gap and turn around at the top is a great feeling," he said. The 21-year-old paid tribute to former team mate Petter Northug, who was not selected for the Games after failing to recover from illness. "For a long time when Petter was doing so well from 2006, it's been a big inspiration for me," he said of twice Olympic champion Northug, known affectionately as the "bad boy" of Norwegian skiing. "When you're starting to go to high school and you're looking up to people doing well in championships, you want to do it well and do it your way, and to cross the finish line and get an Olympic gold medal is quite an unbelievable feeling," Klaebo said.